Jefferson Health – New Jersey’s (JHNJ) (formerly Kennedy Health) use of an integrated, clinical communication platform drastically reduces ED over-utilization, readmissions and wasted care. 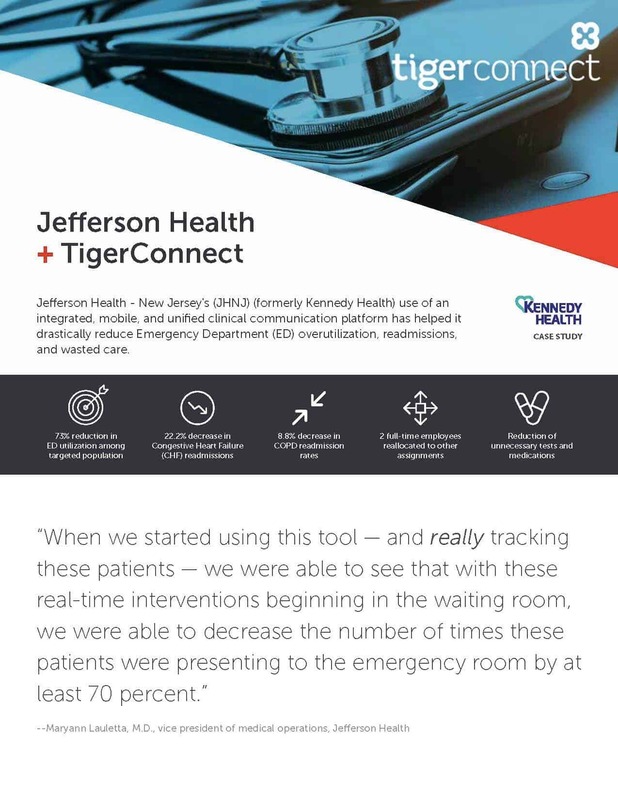 Mobilizing care teams using TigerConnect has significantly reduced readmissions as a whole, but particularly among the ED super-utilizer population. The number of visits among these patients decreased 73 percent, while also reducing the utilization of CT scans and certain medications, all of which reduce costs and provide more effective care. Simultaneously, improved clinical communication among care teams combined with better care coordination helped JHNJ decrease congestive heart failure readmission rates by 22.2 percent and chronic pulmonary obstructive disease readmission rates by 8.8 percent. In addition, centralizing case managers to one location and equipping them with TigerConnect helped them communicate more efficiently and effectively enterprise-wide. JHNJ was able to reallocate two of their 10 case managers to other campuses to conduct face-to-face interventions with patients.